I cut the large poinsettia flower out of white panel and at the same time a piece of masking paper. I then adhered the masking paper to the card base and sponged on Festive Berries Distress Ink. Then I stamped over it with a music background stamp inked with Scarlet Jewel dye ink from Papertrey Ink. 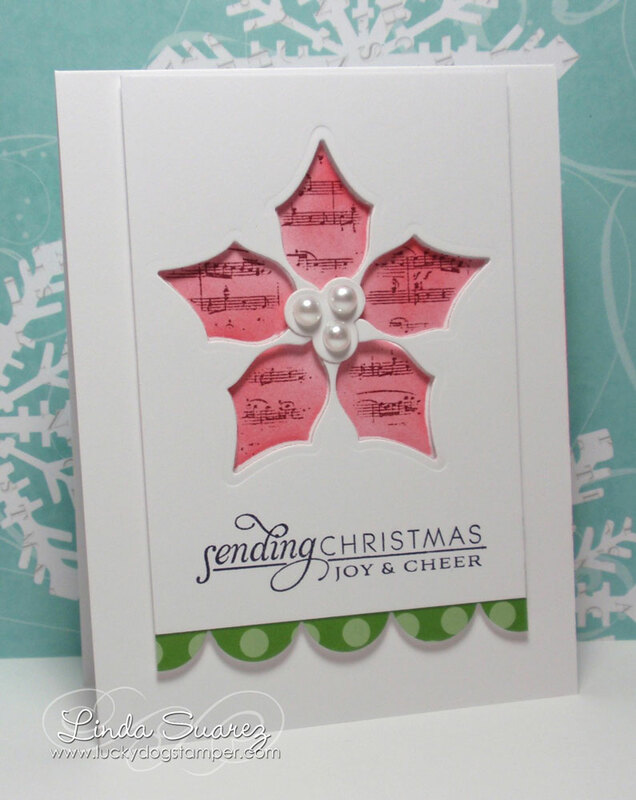 When I removed the masking paper, there was a pretty poinsettia on the card base. I thought about adding a sentiment and calling it a day, but at that point I just couldn't stop. I really like it; I think it's my favorite so far. What a pretty card, the ones I made from this class were my favourite too! What an amazing card! so clean and crisp and pretty. Just love evrything about it. This card caught my eye right away in the gallery - really love it! With just a few nice added details, you really kept the card simple but still extravagant and lovely. Beautiful work! WOW Linda! 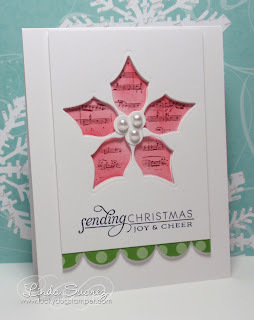 I love how the poinsettia just pops off the card! I am going to have to try this! Thanks for sharing!